Fuse Circus is New Zealand’s premiere circus and physical theatre company. We create and tour dynamic live performances on the stage and in the air, from burlesque indoor shows to spectacular outdoor events. We delight in taking our audience to new worlds where anything is possible! As well as creating our own shows, we specialise in providing award-winning entertainment for corporate and private celebrations. Whatever your event, from fashion shows to product launches and weddings, we can ignite your imagination! Above: Teamwork and timing is everything in Circus - where performers rely on each other to complete the picture. (or day) out. For shows that are a little bit scary, a little bit saucy and a lot of fun... from family audiences through to late night revellers. Take a peek at what's coming up next ! 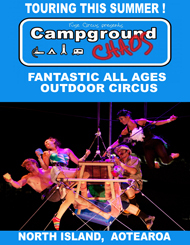 On tour now: the family favourite Campground Chaos this Summer. The wild and wacky camping comedy returns to the lower North Island and the South Island this Summer. Grab your sun hats, your jandles and check our tour dates!. This Kiwi Circus pheomenon is not to be missed! Sell-out shows of Revolver in Christchurch! Thanks Christchurch for coming out and loving Revolver! We love you back - your enthusiasm keeps us going! For a glimpse inside the world of Fuse, all the latest news, and advance notice of upcoming shows, sign up to our gossip column.